If a summer soujorn to Barcelona wasn’t on the cards for you this year, head into Ham & Sherry for a quick Andalusian getaway. It is hard not to be charmed by the blue and white mosaic-tiled eatery tucked away on the buzzy Ship Street in Wan Chai. Capturing the vivacious flair of a Spanish bodega, the Jason Atherton-helmed restaurant boasts a 50-strong sherry list—the largest in town—as well as sangrias, wines, and Spanish staples including a ‘special on the board’ tapas menu that frequently switches up. The charcuterie platter serves up a feast of jamón and chorizo, but the paleta ibérico de bellota (aged 36 months) was particularly outstanding with its smokiness and buttery, earthy flavours. 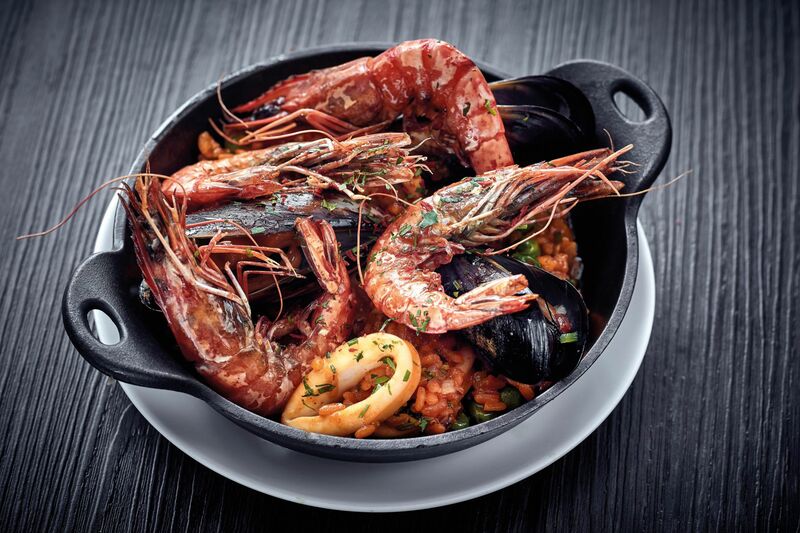 The prawns and clams-studded seafood paella oozed a complex, vibrant aroma, while standout smaller dishes included the beautifully-presented seabass and gambas al ajillo that packed a sharp garlicky kick. The cinnamon sugar-dusted churros dipped in a decadently nutty chocolate sauce put the sweet finish on the Spanish feast. Service is casual, although sometimes hurried and snappy—our only gripe about the otherwise delightful eatery.